We had a brief glimpse of Spring this weekend. Saturday temperatures stretched all the way to 78 degrees with bright rays of sun bringing some life to this cold, dreary April. Mr. T and I used it as an excuse to sit outside at one of our old favorites Zum Schneider. 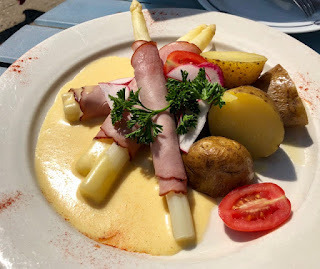 White Asparagus was on the specials menu that afternoon. We both fell in love with this veggie on our first trip to Munich years ago. It has a much milder flavor than green, with a thick, crisp exterior that's wrapped in ham and served alongside boiled potatoes and a thick, creamy hollandaise sauce. 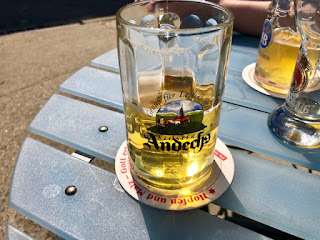 Paired with some Helles Lagers and that bright beautiful sunshine; this was the perfect way to welcome in Spring (if only for a few hours).